Go behind-the-scenes with the film’s extraordinary cast and the real people behind the inspiring true story! 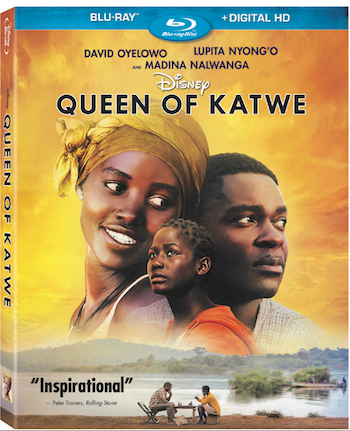 BURBANK, Calif., Nov. 18, 2016 — Home audiences will cheer for Disney’s “Queen of Katwe,” the inspirational journey of a young girl from the streets of Uganda to world-class chess player, which has earned widespread critical acclaim, including a 93% Certified Fresh critics consensus on Rotten Tomatoes. The triumphant film, which is based on a true story, arrives home on Digital HD and Disney Movies Anywhere (DMA) on Jan. 10 and on Blu-ray™, DVD and On-Demand on Jan. 31. Job Application – Robert checks in on the status of his job application. Dancing and Rent – Phiona joins in dancing with local girls before the landlady pulls her away. Entering the Hospital – Harriet tries to look presentable as they rush Brian to the hospital. Phiona’s Chess Club – Phiona comes full circle as she teaches a little boy the same lessons Robert taught her in chess club.